Today I have an extra article for the week, a review of a great new addition to the Age of Sigmar line. 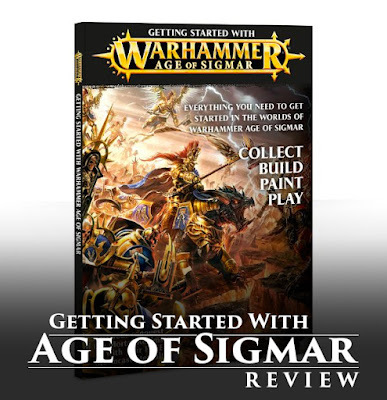 The Getting Started magazine is a fantastic idea and it even comes with a free Stormcast Eternal Liberator! The magazine clocks in at around 90 pages and is full color and lavishly designed. This is the perfect entrance for a new player and a fun read for veterans as well. 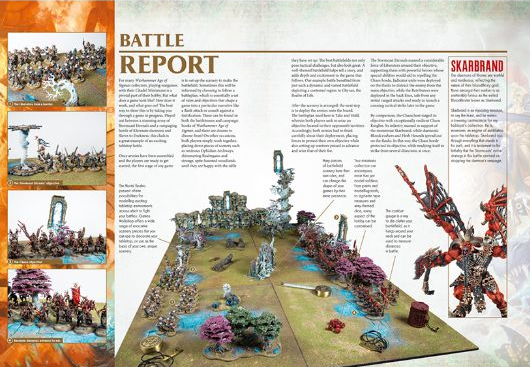 When you open it up the first section you come across is an almost comic book like overview of the AoS story so far up through All-Gates. I say comic book like because they use a bunch of the illustrations we have seen already along with little text boxes. It covers all of the main points and will definitely help catch any new players up with where the storyline currently sits. While looking awesome, this is also a great idea for younger players who may have found a wall of text a little intimidating. It then talks a bit about the different ways and reasons to collect the models, such as for display or for gaming, and talks a bit about the models themselves. All of this has plenty of pictures as well as being very interestingly laid out. This is followed up by a battle report between some Stormcast and Khorne forces. You may recognize the Stormcast here as belonging to Ben Johnson who you can follow on Twitter or his army thread on the TGA Community for even more close up awesome shots of his minis. This battle plan is described in a little more broad strokes then what you may be used to from old White Dwarfs, but remember, this is primarily intended for people completely new to the hobby. It's still a battle report though and I enjoyed reading it a lot. The terrain used on the table is awesome as well! I really want that walking tree and the skull cliff face thingy they had, as well as the Realmgate on top of the really tall tree. The whole things looks absolutely lush and it's a great way to hook new players. This is what games of AoS should look like. 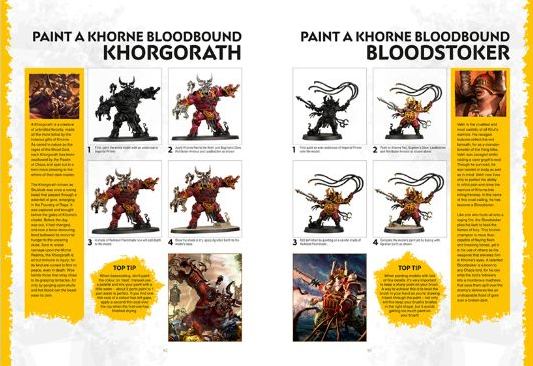 The magazine then goes over some of the ways you can start your collection such as the starter set and the new smaller boxes of Stormcast and Khorne Bloodbound. It then goes over some of the main forces in AoS, the Grand Alliances, and other important things like that, but in a very brief and visually interesting way. This is followed by an 'Eavy Metal showcase and a trio of example forces of Nurgle, Seraphon, and Fyreslayers. The rest of the magazine is primarily dedicated to showing off different painting techniques. There are step by step tutorials for several Stormcast and Bloodbound models, but only using the paints from the new paint sets they are coming out with, so they are very, very basic. They do go over each of the different paint types though, such as Dry, Shade, Layer, etc, as well as the best ways to use them. They even included an overview of all of the technical paints and how best to use them. This is a perfect introduction for a brand new player to painting minis and even shows them so more advanced techniques they can use in the future. Lastly they included the core rules to the game, but in a new format! They are a little longer then four pages, but that's mostly due to lots of pictures being included. Some of these are just for design purposes, while some almost act as diagrams and examples. They also put in a few other clarifications on how stuff works and mention things like other Battleplans and how they work. It's really cool seeing them give the core rules a bit of a makeover and making them more friendly to new players. 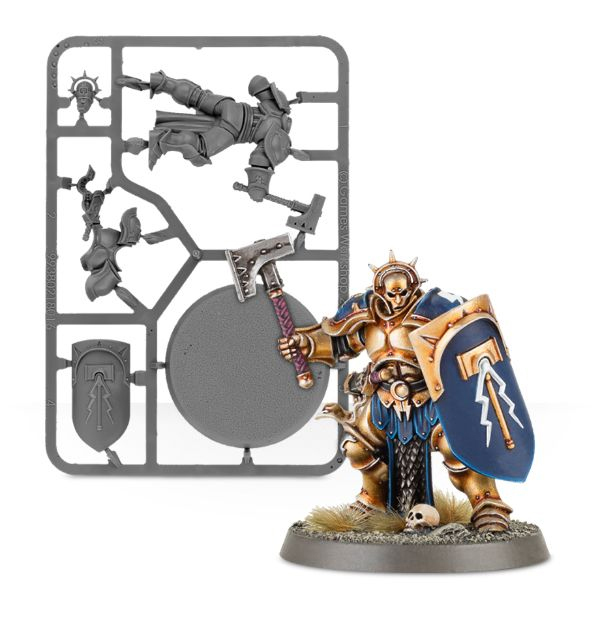 Like I have already said, this is an absolutely fantastic idea by GW and is the perfect first purchase for anyone interested in AoS. I'm already thinking about getting this for anyone I want to try and entice into the hobby. 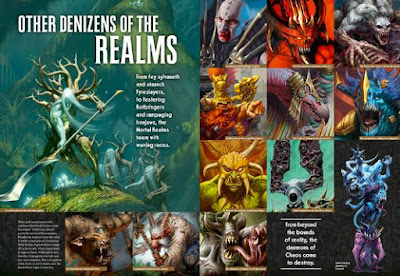 For people already invested in AoS it's still worth picking up, especially at only $8. I know I certainly enjoyed it, plus you get a free Stormcast with it! I hope GW finds a way to get this into more non-hobby stores since it's the perfect gateway. You may see extra articles like this pop up from time to time now when I need to fit in more reviews. Games Workshop was kind enough to send me a review copy of this and I just couldn't let the opportunity go to waste.